This is Jazz. 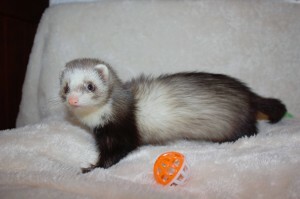 She is daughter of Buttons and Rocket and was born here in our ferretry last year. She tends to be a quiet girl and is quite reserved. She is usually the last one out for playtime and the first one to want to be put away. Click here to view Jazz’s pedigree.